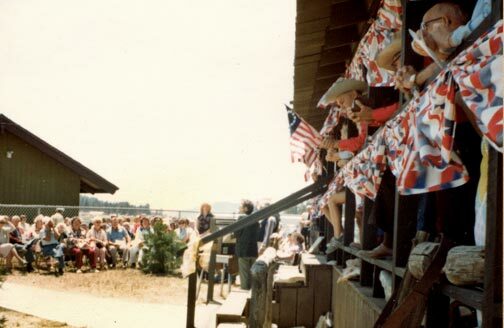 The Big Bear Historical Museum first opened to the public in 1982. It is located in Big Bear City just off of Greenway. 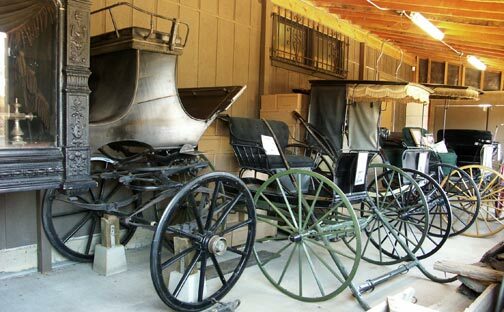 The Big Bear Museum is the most visible result of the hard working volunteer members of the Big Bear Valley Historical Society, who have been working tirelessly since 1971, to collect, document, and preserve, for future generations, Big Bears unique history. The Big Bear Museum is constantly expanding. New artifacts are being added on a regular basis. 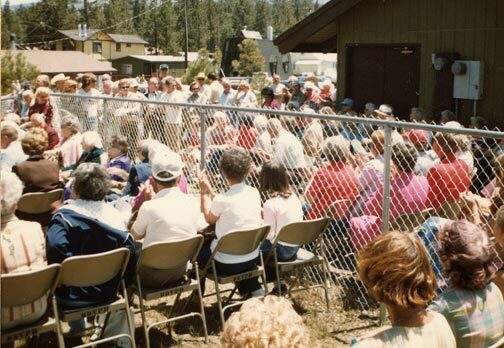 As stated on the homepage of this website, if you are interested in a unique personal experience into what Big Bear’s early years were all about, an actual visit to our museum in Big Bear City is a must. Check back to this page often. I will be adding photos that document the growth of this museum from it’s inception to what it is today. I will also be posting some history about the dedicated people that made it all happen. 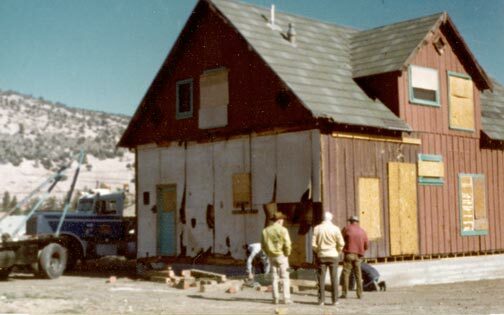 This page begins with a few photos that show the Big Bear Museum back when it was just getting started. The first artifact was the main museum building.day. 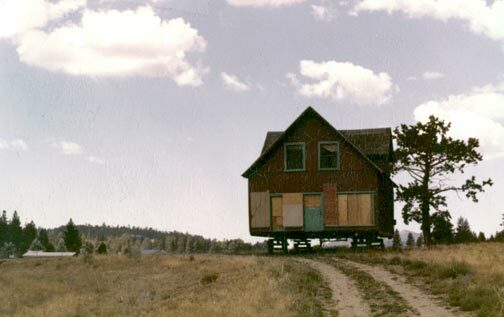 This is the main Big Bear Museum building waiting for it’s foundation at it’s new permanent home where it sits today. – Rick Keppler Collection. The main Big Bear Museum building is lowered on to it’s new foundation. This building was originally the Big Bear City Community Market. – Rick Keppler Collection. 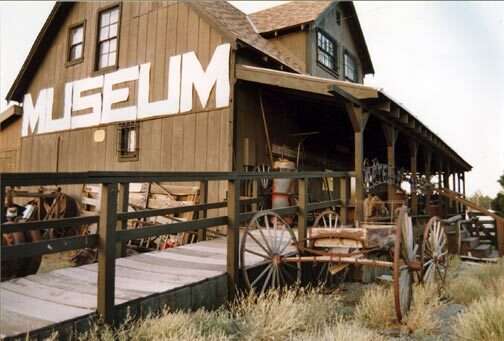 The main museum building as it looked in 1998, after the front porch was added. – Rick Keppler Collection. It took several years of hard work by Big Bear Valley Historical Society members to get this building installed on it’s foundation and the wrap around covered porch built. Finally on June 12, 1982 the museum was dedicated, and opened to the public. Here are photos of that landmark day. Another view of the Big Bear Museum dedication event. – Rick Keppler collection. Over the years the museum has been used many times as a movie set for the filming of the Channel-6 History Show. My good friends Tim and Kim Sweet, the Big Bear Museum curators, would always take the time from their busy schedule at the museum to host this show whenever they were needed. Tim Sweet unexpectedly passed away in March 2010. He will greatly missed by myself and everyone who knew him. As you wander around the Big Bear museum grounds, you will notice the main museum building has been added onto and expanded. One of the additions is the Surrey Room, which houses a collection of old smog free vehicles that can get up to 30 miles per gallon on a bale of hay. Here are a few photos of that collection. 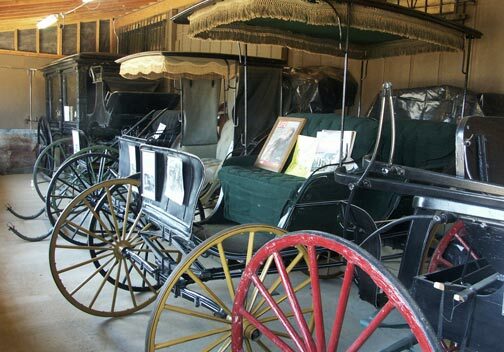 The Big Bear Museum houses a collection of restored wagons, surreys, and even an old hearse. – Rick keppler Collection. The Big Bear Museum’s surrey with the fringe on top was actually used in a production of the musical Oklahoma. The 1955 movie Oklahoma stared Shirley Jones, who has been a Big Bear resident for many years. – Rick Keppler Collection. 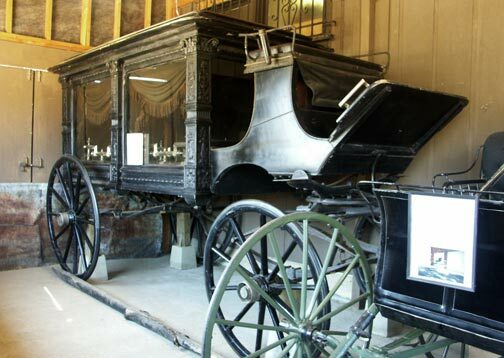 One of my favorite vehicles in the Big Bear Museum’s Surrey room collection, is this immaculately restored hearse. – Rick Keppler Collection.